Give us a call. Tell us about your event. Our team will submit a design plan on paper, source the proper sand from a local merchant, and assist you with scheduling the sand delivery. If necessary, our artists will arrive early to build a sand box and oversee the sand’s arrival to the site. Once the sand is in place all we need is a bit of water, a strong back, and our imagination. How long does it take to build a sand sculpture? Size of the sculpture, complexity of design and the number of artists, help determine how much time is necessary to complete a sculpture. 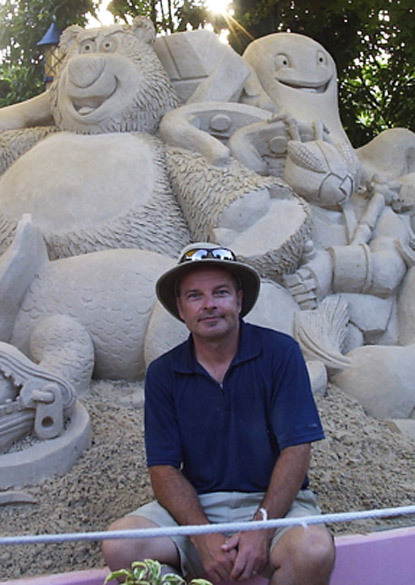 Our sand sculptures range in size from 1 artist, table- top sand sculptures performed in mere hours, to large gated events involving a team of artists, heavy equipment, hundreds of tons of sand and many days to produce. Fitting on a 6ft trestle table, these sculptures are often used in hotel lobbies, banquet halls, weddings or in trade booths at conventions. The sand often arrives with the artist on a dolly and removed the same way. This sand sculpture size is our most popular size. This amount of sand should be delivered to site and tipped by truck. One artist four to five days is necessary on projects this size. A 20ft x 20ft area is required for this size sculpture. 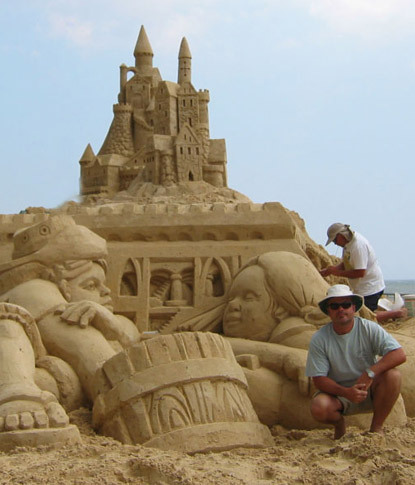 A sand sculpture of this size often requires two artists over a one week period. Depending on your event schedule and accessibility to the venue in advance, one artist can complete this size in two weeks. A 30ft x30ft area is required for this size sculpture. What if my event lasts only one day, can I still have a 50ton sand sculpture? The answer is Yes. As long as we have access to the sculpture site, some days in advance.